SECTION 101 APPEALS TO APPELLATE TRIBUNAL:- The provisions relating to filing of appeal to the appellate tribunal are discussed in this update. The appeal provisions prescribing time limit for filing appeal to Tribunal are similar to that for filing appeal to first appellate authority with the distinction that the first appellate authority can condone delay in filing appeal upto one month but Tribunal can condone delay in filing appeal for any duration. The provisions regarding mandatory pre-deposit are similar to that of filing appeal to first appellate authority that have already been discussed in our earlier update. Presently, under Central Laws, appeal against the orders passed by rank of Commissioner is directly appealed to the Tribunal so as to reduce the appellate stage in cases involving huge taxes. Moreover, assessee is also benefitted as he is not required to pay mandatory pre-deposit of first appellate authority. However, neither the old GST law nor the revised GST Law provides exception to the filing of appeal in case of orders passed by the rank of Commissioners. This will lead to orders involving huge tax amounts also appealable to first appellate authority thereby hindering speedy disposal of litigation. Moreover, assessees will have to pay mandatory pre-deposit at first appellate authority also for orders passed by the rank of Commissioner which will definitely increase the cost of litigation. There is provision that even revenue authorities may prefer appeal to the Tribunal if the Committee of Commissioner is of the opinion that the order is not proper. However, deeming provision has been made that if there is difference of opinion as regards legality of an order among the Commissioners appointed to form Committee of Commissioners, it shall be deemed that the Committee has formed the opinion that the order under review is not legal or proper. If this provision is compared with the provisions prevalent in Central Excise Laws, it is found that if there is difference in opinion among the Committee of Commissioners, the matter is referred to the Board for final decision. The deeming provision will ensure that in case of difference of opinion, the appeal is preferred by revenue authorities. This is not fair particularly when it is observed that revenue authorities do not accept any decision unfavourable to exchequer and such a deeming provision will encourage the practise of filing frivolous appeals by revenue authorities thereby increasing litigation. 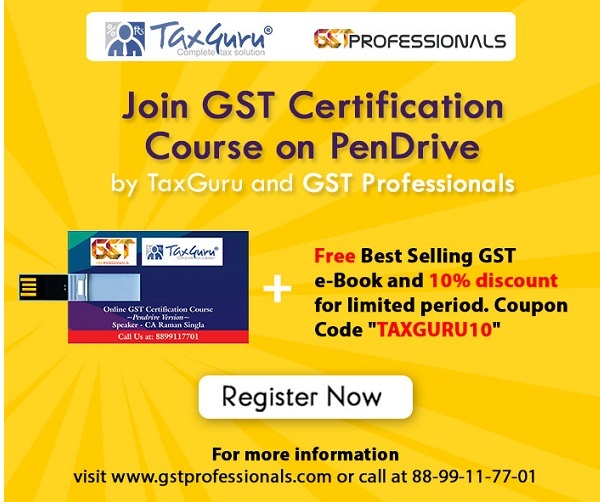 Under Old GST Law, although there was provision for filing cross objections within 45 days of receipt of notice of filing of appeal to the Tribunal by the respondent and it was mentioned that such cross objections will be disposed of as if it were an appeal presented to the tribunal but there was no specific provision that provisions of mandatory pre-deposit would apply even in case of filing cross objections. However, under the revised GST Law, the provisions of mandatory pre-deposit have been applied mutatis mutandis to cross objections filed by respondent. This provision will raise many doubts regarding computation of quantum of mandatory pre-deposit for cross objections filed by the respondent. One may also think the need of mandatory pre-deposit for filing cross-objections as when the revenue department is in appeal, why the assessees should be asked to make deposit.